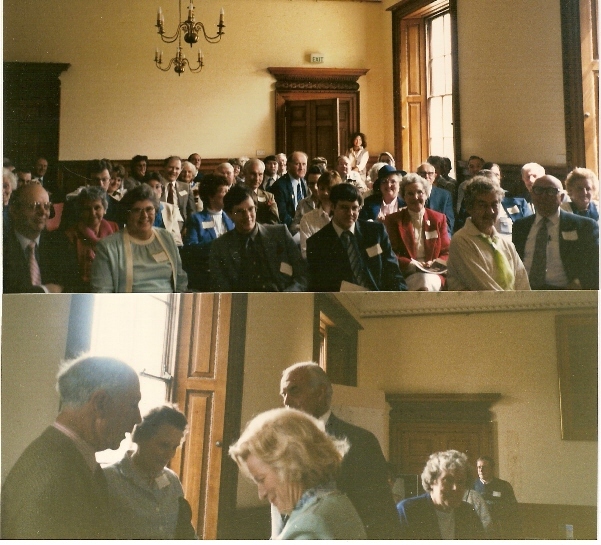 Approximately 100 people attended the first International Shirley Convention May 13, 1989. They were interested to learn more about the history of the Shirley family and to meet one another. The day started with registration at 9AM. By 9:30AM everyone took their seats and Mr. Oliver of Staunton Harold introduced Betty Shirley. They heard about the Shirley story starting in 1086 and how the lineages have descended. A large family group chart was on display and used to explain the families through the generations. Also on display was a large map of England showing where the Shirleys had lived in the 1500 and 1600 hundreds. Before the lunch break, each Shirley descendant at the convention stood and introduced themselves and gave the name and area their earliest Shirley ancestor was from as known by their family. 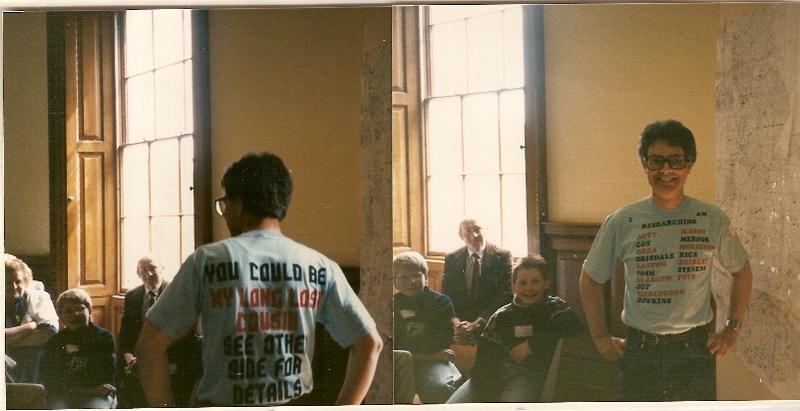 As we came to those sitting in the back of the room, one came to the front. As he approached the front, everyone was laughing. He asked everyone to look him over, he wouldn't mind as he was wearing a T-shirt that said on the back: YOU COULD BE MY LONG LOST COUSIN. SEE THE OTHER SIDE FOR DETAILS. The front listed the names of families he is researching. It was clever idea and everyone had fun with this. He was a hit! Later in the meeting most discovered their connection to a branch of the family. The excitement was growing as they began to see the possibilities of meeting other families who might be related to them. 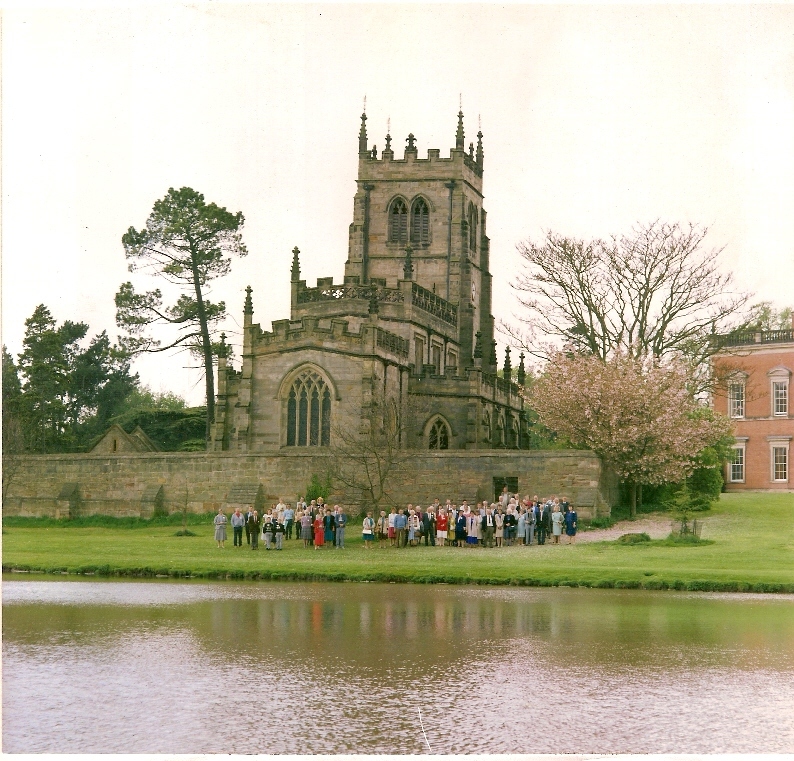 Just before lunch we all gathered for pictures outside in front of the manor house of Staunton Harold and another in front of the Chapel. As we were walking down to the Chapel, the Earl Ferrers and his wife, were arriving and walked with us for the photo shoot. 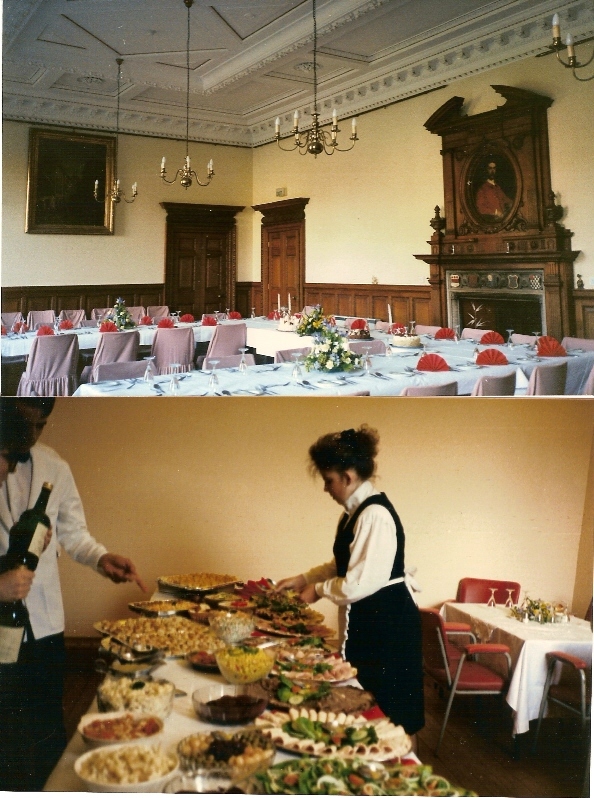 After the photo shoot, lunch was served in the manor house. Everyone seemed to be enjoying the occasion as they chatted away. When the afternoon convention resumed, the Earl Ferrers and Major John Shirley were our guest speakers. Staunton Harold is the former home of the Earl Ferrers family and Ettington is the former home of Major John Shirley who has leased it to a hotel group. The audience was given the opportunity to ask question of both speakers. A great time was had by all. During break times some of the Shirleys spent a great amount of time looking at books we had brought over for the convention. Several reported finding material on their family. It was great to see their enthusiasm. Shirleys attended from England, Australia, New Zealand and the USA. We all felt a close kindred connection in spite of the miles difference. Following the Shirley Convention we were off to visit other areas of England such as: Breedon on the Hill (near Staunton Harold), Ashby De La Zouch where Lady Huntington, (Selina Shirley) is buried, Chartley Castle that was in the Shirley family at one time, Shirley Village, Sherwood Forest, Boston where the Pilgrims were before coming to America, Wiston (manor home of Sir Thomas Sherley the elder, Ote Hall (home of Governor William Shirley of Massachusetts before he came to America, Preston Manor (where Governor Shirley was born, and Isfield Village (home of Sir John Shurley). 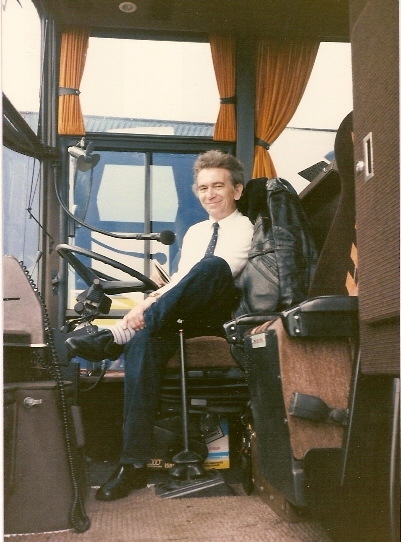 We were lucky to have a great coach driver who was delightful and entertaining.